Choose quality workmanship, reliability & longevity for your property. 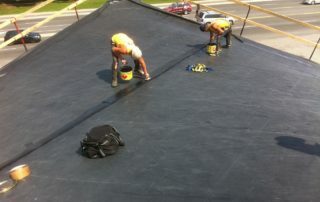 TPO, EPDM & TTR rubber roof retrofits, replacements and repairs. Get waterproofing & insulation for maximum roof performance. Free Annual Roof Inspections At No Extra Cost. 20 & 30 year extended & transferrable warranties available. Canada ranks Mississauga as its 6th biggest city. It is fast-growing, as evidenced by more than 55,000 businesses in the area. In Mississauga, you will find head offices of Fortune 500 companies. Starting and growing your small business is a great plan since you can easily access resources. Based on the 2016 census, Mississauga has a population of 721,599. The city has a humid and continental climate. With high humidity levels and cold winters in your geographical area, your commercial roof’s lifespan can be shortened to less than 15 years. Punctures in your roofing system cause leaks, make your energy bills soar, and promote the growth of mold that put your health at risk! And if you’ve paid for unsatisfactory workmanship, your insurance claims can be forfeited – in addition to the roofing repair costs you’ll have to face. We’re here to tell you that you’ll be able to enjoy smoother sailing business operations and a higher return on investment by having a good roof. A commercial roofing’s main purpose is to provide protection to you, your equipment, and employees. When your roof breaks down, leaks and structural damage can cause unwanted disasters. What you need is a Mississauga roofing system that resists moisture buildup and structural movement and does not shatter even in extreme temperatures. This allows the roof to last for years while requiring less maintenance. Commercial roofing systems like EDPM last up to more than 30 years. Total roof replacements are not only costly, they also disrupt a building’s inhabitants and nearby establishments. The good news is, there’s a much better alternative to a roof replacement. If you’ve heard of a commercial roof retrofit, it’s a process where a new roofing system is installed above an existing roof. It’s environmentally-friendly, causes minimal noise, and allows you to save more since it lasts longer. With our selection of reliable commercial roofing systems in Mississauga, you’ll never have to worry about roofing problems again. Our conventional roofing systems are high-performing Firestone products which are the single ply EDPM and TPO roof membranes. If you opt for one of these instead of our TTR® system, you can still benefit from energy-efficiency and a cooler environment. 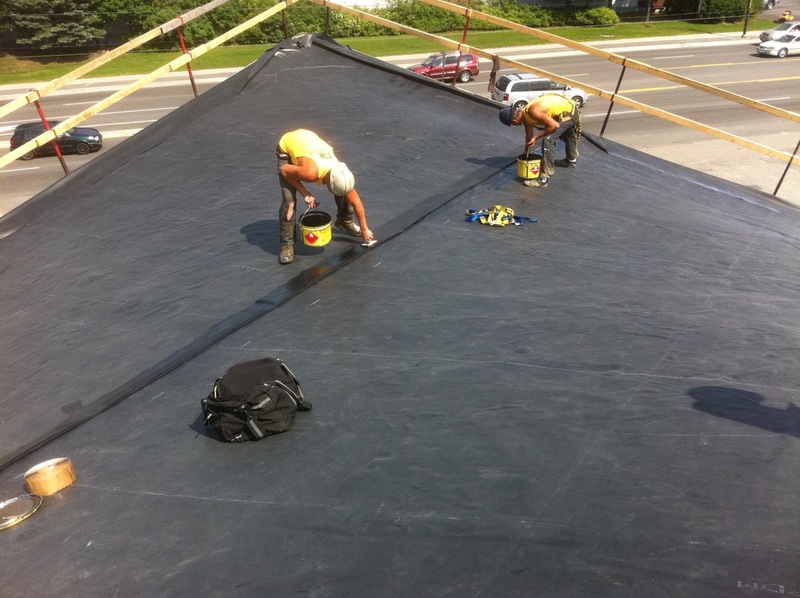 The EDPM and TPO roofing systems in Mississauga are highly popular options. 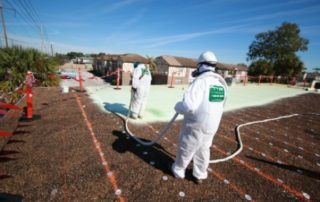 However, TPO is the newer type of roofing system among the two which may explain why more commercial building owners choose EDPM. Regardless of what you’re more familiar with, we can assure you that our single ply membranes are worth your while. Finding a good professional roofing contractor to handle your roof inspections, repairs, and installation is hard. A lot of people end up hiring inexperienced roofers because of being pressured and offered a very cheap price. Aside from the fact that we’re within your geographical location and therefore understand the weather better, our roofing systems have been trusted by customers. You can read our reviews We are a company of experienced and well-trained contractors. Not only will you benefit from a good roof, you’ll also be assured that your roof will be properly installed. Furthermore, we provide a 10 and 20-year renewable warranty and conduct yearly inspections at no additional cost to make sure that your new roofing system stays in tip-top condition. Not sure whether to choose our TTR® system or single ply roofing membranes? Get in touch with us today! To whom it may concern: Our technical people are extremely impressed with the performance of the Cox Roofing System. It combines the flexibility of an insulation that can be applied to any thickness with the strength and durability of an EPDM membrane. For our own commercial buildings, we have used Cox Roofing Systems Exclusively. OAA FRIAC RIBA, Osburn Associates Architect Inc.
To whom it may concern: Our technical people are extremely impressed with the performance of the Cox Roofing System. 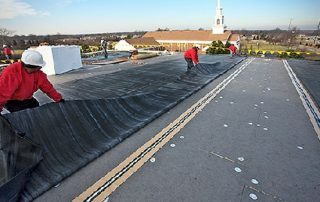 It combines the flexibility of an insulation that can be applied to any thickness with the strength and durability of an EPDM membrane. For our own commercial buildings, we have used Cox Roofing Systems Exclusively. We were extremely pleased with the Cox Roofing System on our original industrial building. The process of redoing our roof went very well. No problems and in a timely fashion. The extra insulation has been a benefit for all of us in the building. We are saving in both heating and cooling costs. The process of removing the extra weight from the building has now given us another opportunity. A large solar panel installation will now be erected on our TTR® roof. This allows our company “Gezak Properties” more financial rewards from the electrical output of the solar panels. The roof has worked so well that we are now in the process of doing the next one. Two years ago, we called on your professional services to remedy the problems we were experiencing on our Service Building roof. We had ice forming on the roof causing water to run inside the building over top expensive equipment, and also high voltage control cabinets. Another factor that made us approach your company was the fact that fair size ice formations had already come down the roof and could have caused bodily injuries to employees working at this station. 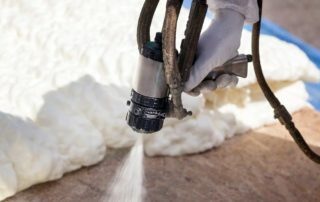 Since your company has insulated our roof with your Foam Roofing System, three problems were totally eliminated: water leaking on equipment, ice formation on the roof and heat loss. It is my belief that the money saved in heating costs paid the repair of that roof the very same year. Thank you very much for a job well done! Dear Sir, Two years ago, we called on your professional services to remedy the problems we were experiencing on our Service Building roof. We had ice forming on the roof causing water to run inside the building over top expensive equipment, and also high voltage control cabinets. Another factor that made us approach your company was the fact that fair size ice formations had already come down the roof and could have caused bodily injuries to employees working at this station. 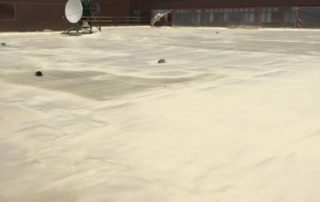 Since your company has insulated our roof with your Foam Roofing System, three problems were totally eliminated: water leaking on equipment, ice formation on the roof and heat loss. It is my belief that the money saved in heating costs paid the repair of that roof the very same year. Thank you very much for a job well done! I purchased a new home with Aspen Ridge Homes and had the worst experienced with our brand new roof. The house is less than 6 months old, but the roof had so many defects that during rain season and spring thaw, water was pouring into my new home causing major structural damage. I knew the only solution to get this fixed properly was to get the entire roof replaced by a reputable, reliable and qualified roofing company. I spoke with Wayne, the owner at Cox, and he immediately scheduled a meeting at my house. He was prompt in his quotation, reasonable in price and provided a high-quality roofing system that's worth its value for years to come. It even comes with a 10 year warranty which gives home owners like myself instant peace of mind. His team including site manager Devon was professional and completed on-time without delays. I'm so happy I choose Cox Roofing System and this is one solid roofing company I would highly recommend. I purchased a new home with Aspen Ridge Homes and had the worst experienced with our brand new roof. The house is less than 6 months old, but the roof had so many defects that during rain season and spring thaw, water was pouring into my new home causing major structural damage. I knew the only solution to get this fixed properly was to get the entire roof replaced by a reputable, reliable and qualified roofing company. I spoke with Wayne, the owner at Cox, and he immediately scheduled a meeting at my house. He was prompt in his quotation, reasonable in price and provided a high-quality roofing system that's worth its value for years to come. It even comes with a 10 year warranty which gives home owners like myself instant peace of mind. His team including site manager Devon was professional and completed on-time without delays. I'm so happy I choose Cox Roofing System and this is one solid roofing company I would highly recommend. I Just want to thank you for a great job on our roof. This last section went extremely smoothly and looks great. The new flashing guy did a first rate job. A night and day difference from the last guy. Wayne, I really appreciate you taking care of us and getting those final details done. I look forward to our next project together. Take care and thanks again. I Just want to thank you for a great job on our roof. This last section went extremely smoothly and looks great. The new flashing guy did a first rate job. A night and day difference from the last guy. Wayne, I really appreciate you taking care of us and getting those final details done. I look forward to our next project together. Take care and thanks again. Rob.